We’ve mentioned before that your outward appearance speaks volumes even before you open your mouth. And nothing conveys clearer that you mean business than being decked up in a bespoke business suit. So what is it about business suits that commands respect from the people that you meet? A medieval knight, all decked out in a suit of armour, commands the respect of the people that he encounters. It’s the epitome of what it means to be a warrior and a gentleman. Likewise, a business executive of today, all decked out in formal business attire, is also the epitome of what it means to be a modern gentleman. Just like how a medieval knight’s armour is tailored specifically to his body’s shape and size. Likewise, a business suit is also tailor-made that way too. 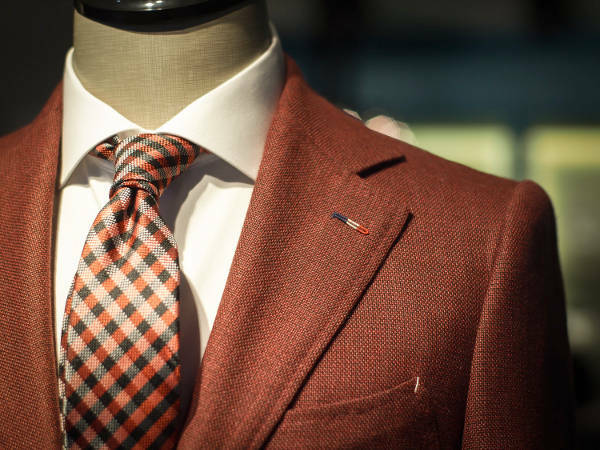 Of course, you can walk into a departmental store, and pick up a ready-made business suit. But understand this, it’ll never truly fit your body like a glove. Only a true bespoke suit can do that, as every individual’s body shape and size are completely unique. There’s no such thing as a “small”, “medium” or “large” suit that can cater for everybody. Note: The term “business suit” here is used loosely, as it’s also meant to include other non-matching, but equally business appropriate attire too. There are hundreds of tailors specialising in classic men’s wear in every major city in the world. However, not many of them offer true bespoke service. When you first visit a bespoke tailor, you don’t announce what you want made, and then start haggling the price. Any tailor can measure you up, cut up your selected fabric, and sew them up to make you a suit. 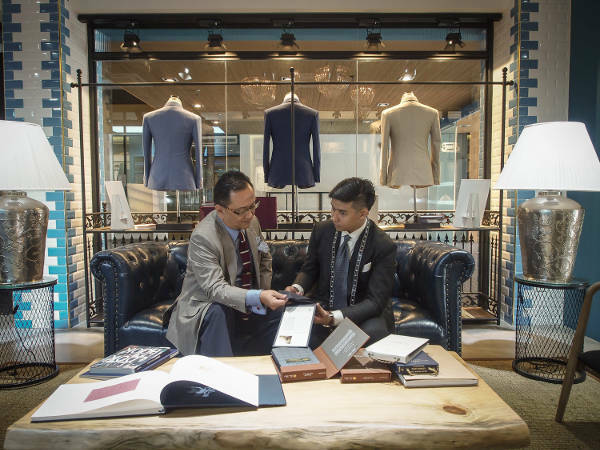 But a true bespoke tailor will invest the time to develop a relationship with you, the customer. A true bespoke suit fits you like a glove. It not only has to physically fit you, but also fit your purpose, lifestyle, preferred fabric, cut style, suiting details, and a whole lot of minor factors that you never even knew was important. 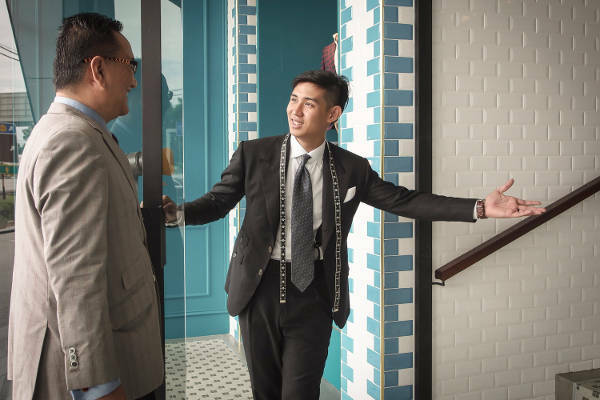 And the wonderful thing is that the master tailor derive all these details not by asking you directly, but subtly during what appears to be small talk during your visit. Once the pleasantries are done, it’s time to get down to actually building up the final product, the business suit. There’re just a few basic steps to complete, but each step represents a whole new experience on its own. Depending on the final product that you want made, there are choices of fabrics that you can choose from. A typical formal business suit will generally be made out of wool. But there’re also a whole range of other fibres to choose from too. It all really depends on the climate, level of formality, and personal preference. Cotton, linen, silk, alpaca, cashmere, merino, mohair, angora, etc., and a whole cocktail of different blends of two or more fibres. The sky is literary the limit here. Here’s where the recommendation of an expert comes in useful. 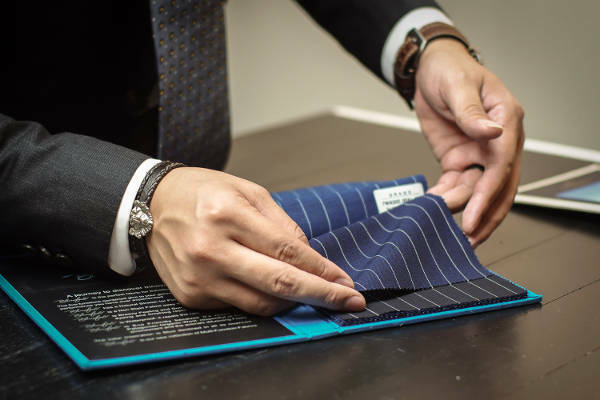 A good tailor will be able to recommend you a suitable fabric, based on your requirements. And the wonderful thing is that you may not even know what was it that you really wanted in the first place. Leave it to the experts to decipher the best choice for you. Here’s where the fun part comes in. You get measured up for your suit. 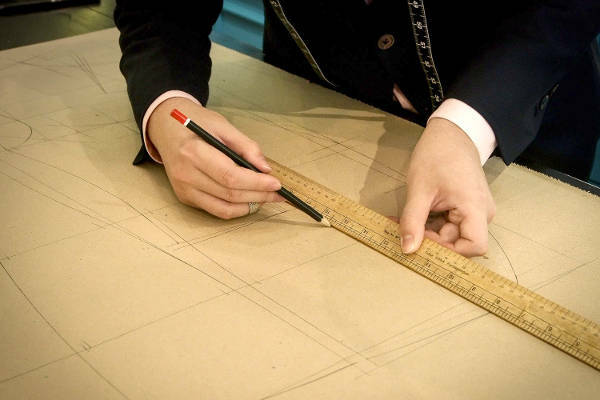 What makes bespoke tailors different from the “regular” tailors is the additional information that’s derived from the measurement. It’s not just the length and width of the shoulders, sleeves, chest, etc. It’s also how much fabric to let out, how much to take in, the angle of the shoulders, the different lengths of each arm, and a whole range of minute details. A suit, especially a jacket, should fit you like a glove… literary… And that’s not an easy task. You have to take a two-dimensional fabric, and sculpt it into a three-dimensional garment. A properly cut jacket should conform to your body, fitting you like a second skin. Not only that, it still need to afford you a whole range of body movement too. And that’s a very tall order indeed. All the measurements are now transferred into a paper. That’s the main difference between bespoke tailoring and “regular” tailoring, which lacks this important step. Every customer’s measurements will come with their own unique paper patterns. And these paper patterns will form the template, from which the fabric will be cut to make the suit. Remember, there’s no such thing as a one-size-fits-all in bespoke tailoring. It is this stage, that the actual work begins, and your dream business suit starts to take shape. In the next article, we shall follow the progress of constructing the suit. And we shall also explore what else makes a bespoke tailor different from the “regular” men’s wear tailor. A special thanks goes out to Sayap Bespoke Tailor PLT for allowing us to write this story and capture the images. 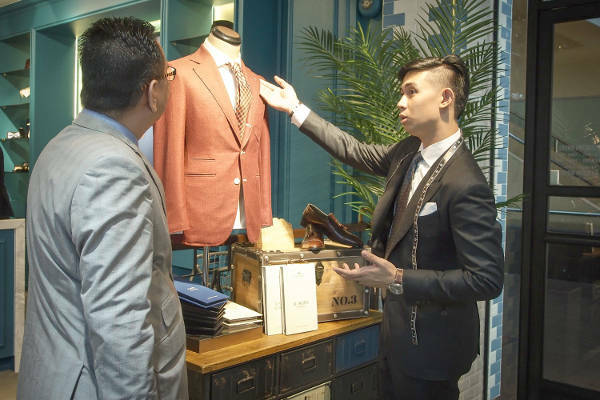 This entry was posted in Branding, Lifestyle, Personal and tagged bespoke, experience, fabric, paper, pattern, sayap, suit, suiting, tailor by CHOW Wei-Ming. Bookmark the permalink.